Scriptwriter JK Rowling received backlash and was accused of being racist for making an Asian actress play the villainous role of Nagini in the new film. In response to the issue, JK Rowling provided an explanation. However, the criticism continued. On October 23, Claudia Kim was interviewed at a theater in Seoul. 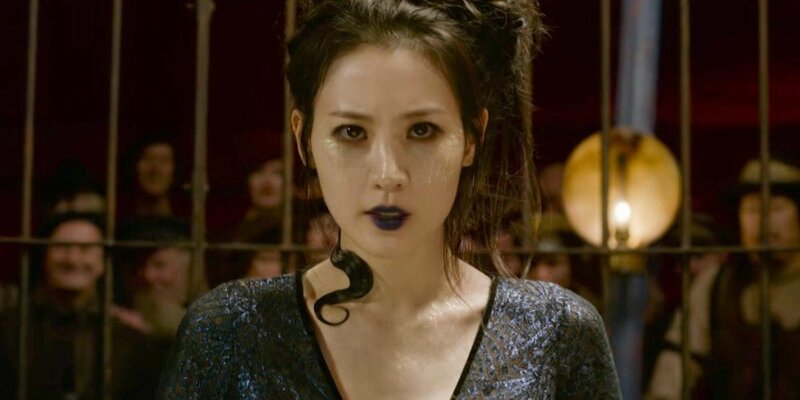 Regarding the racism controversy, Claudia Kim said, "It was unexpected," and explained, "When I found out that I'm playing Nagini, I thought it was meaningful because it's an important character in the 'Harry Potter' series. 'Harry Potter' is a franchise film with many caucasian actors, so I thought many Korean viewers would be happy." Claudia Kim, who has already watched the completed film, added, "I'm looking forward to viewers being satisfied and the controversy fading away once the film premieres. I don't perceive such controversy solely in a negative way. I believe changes can be made by giving attention to an Asian's promotions (like this) and through the people that look into such issues." She also shared, "I think Nagini should've been played by an Asian. Scriptwriter JK Rowling probably searched for an Asian actress because she researched the origin of Nagini. I'm not sure if it's just my pride, but I think I was able to bring out a different vibe as a Korean in Hollywood where there are many Korean Americans." Lastly, Claudia Kim emphasized, "The scriptwriter is good at giving a twist to a story. She's able to bring out a new side through an unexpected character. Also, this film was directed by director David Yates who has taken charge of the 'Harry Potter' series multiple times. He's knowledgeable about the original series as much as the writer so I followed him with trust." Meanwhile, 'Fantastic Beasts 2: The Crimes of Grindelwald' will be released in theaters on November 16. I hate how people take things SO seriously. Obviously she didn't have a problem with it and neither should we. People think to deep about things. If the snake had been played by an African American people also would have found some way to call it racist. I hope we learn to be more positive and not always jump to the worst possible answer, no matter the race. IZ*ONE win #1 + Performances from April 18th 'M! Countdown'! Watch NCT 127's debut performance of 'Superhuman' on 'Good Morning America'!